NOTE: This post is a continuation of the previous one. Once children have mastered some of the pre-reading skills I discussed yesterday, they may be ready to move into the "traditional" Montessori language materials. There is no hard and fast rule for determining readiness, in my opinion. 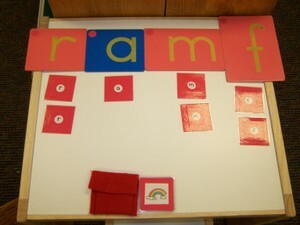 Certainly if they are showing interest in letters and sounds, they are ready. However, I think it is fine to invite any child to use the sandpaper letters. Their response to the letters will tell you whether or not the timing is right. 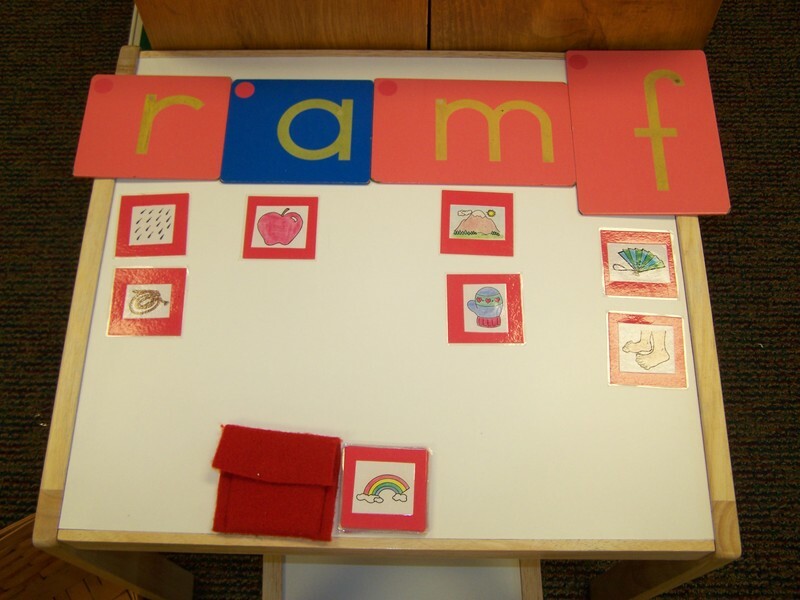 When I previously taught in a Montessori preschool setting, I did have occasions where I introduced children to the sandpaper letters and they did not want to continue working with them. AND THAT IS FINE!!! However, MANY of my three and four year olds were VERY interested in learning their letters and sounds. I think it is really important to point out that doing something early does not mean doing it "better" in the long run. It is a common misconception that Montessori schools "push" children into academic tasks before they are ready. A classroom that adheres to the underlying philosophy of Maria Montessori would never support or encourage that. Instead, children are not "limited" to doing only certain activities based on age. Thus, a three-year-old who is interested in learning letters and sounds doesn't have to wait until they are five or six. Conversely, a five-year-old who is uninterested is not pushed into it just because they are five. An important thing to keep in mind is that most traditional kindergarteners are not expected to master the letters and sounds of the English alphabet until the END of their kindergarten year. Therefore, children who have not learned their letters and sounds BEFORE entering kindergarten are not behind. Remember my last bird standing? As I pointed out in that post, he is not a "worse" or "less capable" robin just because he wasn't "ready" to leave the nest when the other babies did. The same is true for children. Trust them to know when they are ready. Period One (Naming): Show the child the /r/. Model tracing it with your index finger. Say, "This is /r/." NOTE: You will say the SOUND of the letter, not the letter name. However, if you feel the child can handle both labels at once, go ahead. In my opinion, that is up to your discretion. Oftentimes, the child may say, "That's letter 'r'!" To which I would respond, "Yes, it is. And the sound it makes is /r/." Have the child trace the letter with their finger a few times. I also have a sand/salt tray on the table when I introduce the sandpaper letters. Following the first period, I would model drawing the letter in the sand/salt, then have the child try it. Period Two (Receptive): Point to the letter you just named and say, "Show me /r/" or "Put /r/ on your head. In this period, you are trying to see if they can receptively identify the correct sound. NOTE: Once you have introduced the second letter (in my set-up that is /a/), you would be using both letters for the three-period lesson. Then it makes more sense to say, "Show me /r/" and "Put /a/ on your knee", etc. It seems a little obvious with only one letter!! However, as you introduce letters, you can have several "old" letters out to review along with the "new" letter. Period Three (Expressive): With the letter (or letters) you have introduced on the table, point to a letter and say, "What is this?" or "What sound?" This requires more understanding on the part of the child than Period Two. Not only do they have to visually recall the shape of the letter, they must auditorially produce the associated sound. This shows the first sandpaper letter I would introduce along with my "salt tray." I have this little table pushed right up against the shelf that contains all the beginning language work. To introduce the sandpaper letters to children, I plan to station myself (and them) at this table. I had a similar set-up when I taught Montessori before and the children quickly learned where to go to learn their new sounds each day. And believe me, I had a line of kids ready every day to "do their sounds" with me. 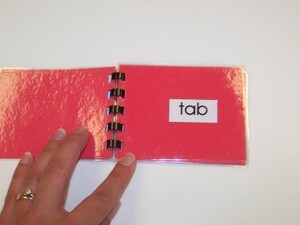 After I introduce a sound, the child puts the sound into their "sound book". 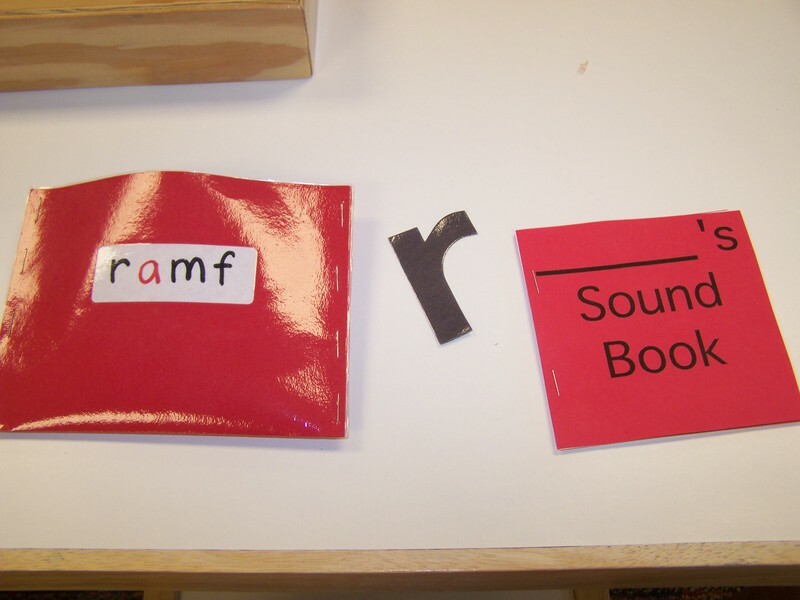 I have color-coded sound books that correspond to my three groups of letters. The left photo shows the "sound book" on the right. The child's name would be written on the line. In the past, I've had access through our area education agency to a machine that punches out large letters. I made up little envelopes (far left in left photo) to hold the letters. Once the child had been introduced to the letter, they glued that letter into their sound book. The next day's lesson always then begins with "reading" their sound book. The sound books serve a couple of functions. First, they help me keep track of which letters have been introduced to which children. Second, they allow the children to frequently "review" their sounds. AND the children LOVE reading their sound books. 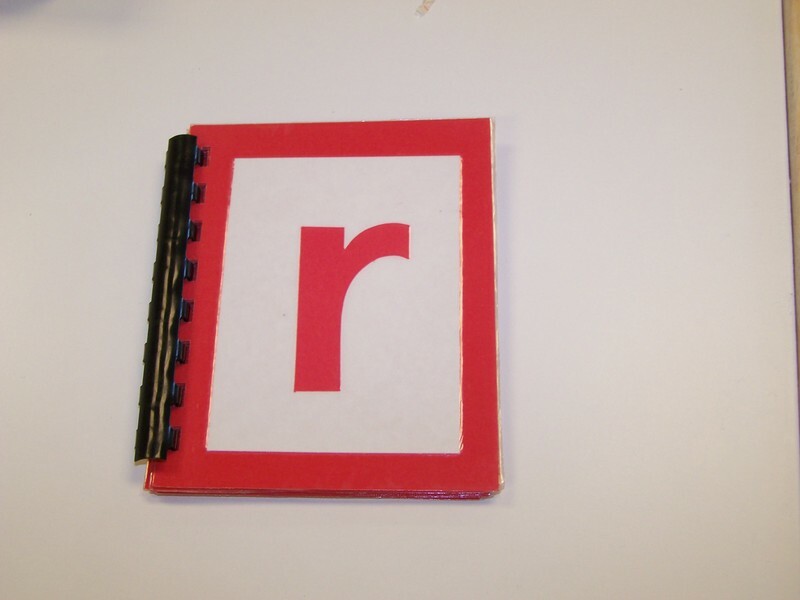 The right photo shows the inside front page of the book with the "r" glued in. The "red" book has a front and back cover and 8 white pages in the middle. I like to only put one letter per page and not have letters on facing pages. 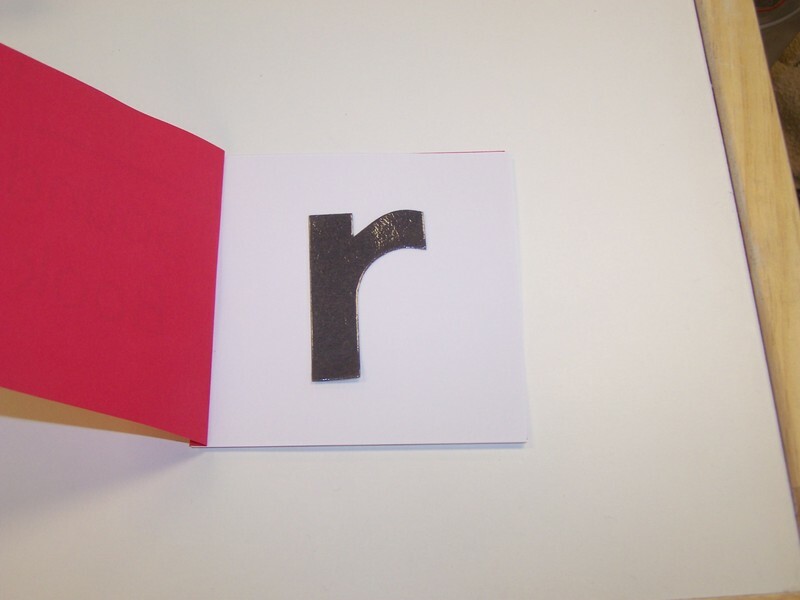 When I introduce a letter, we also usually "read" the little letter books I have made up. I made these several years ago and don't have the files to share, unfortunately. I just copied and hand-colored everything. They would be easy to make now using computer clip-art. I only have these for the consonant letters. Basically, they just have a picture on each page that begins with the corresponding letter sound. When we read it, we emphasize the beginning sound (i.e. /rrrrrrr/ rabbit). In my system, there are 8 "red sounds." These sounds are sub-divided into 2 groups of 4. 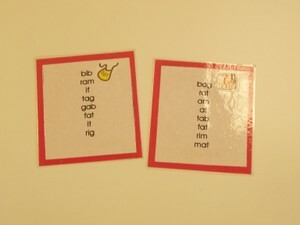 So, when children have learned the first four "red sounds" (/r/, /a/, /m/, /f/), they can do a few corresponding activities. The photos above show the picture sorting activity for the first 4 red sounds. As you can see, the sandpaper letters are arranged at the top of the table (this could be on a rug). The little red felt pouch holds the letter cards which are sorted by beginning sound. The right photo shows how the cards are marked on the back with the correct letter to allow for self-correction. You can click on the photos to view larger. 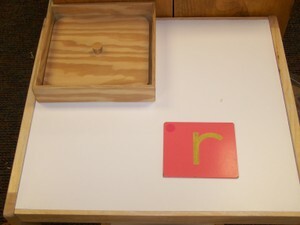 These photos show the object boxes for the first 4 "red sound" letters. 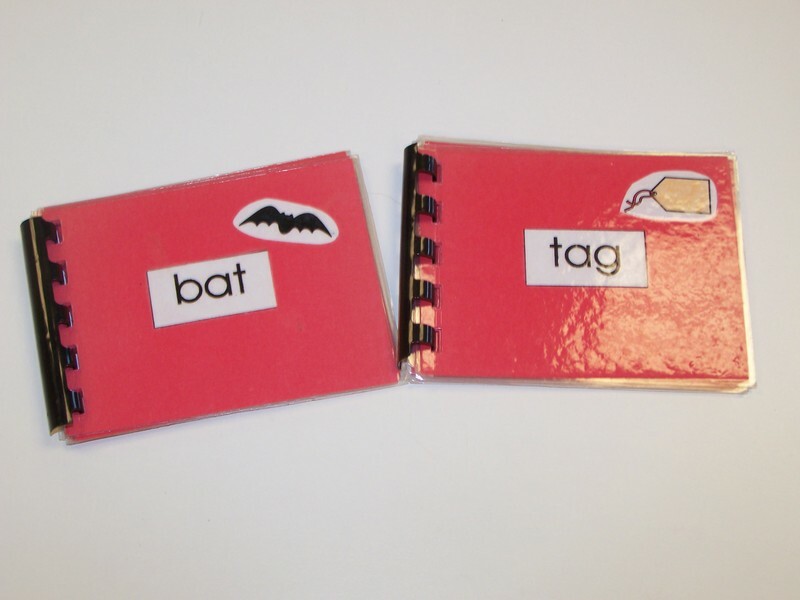 This activity can also be completed once children have learned these 4 sounds. 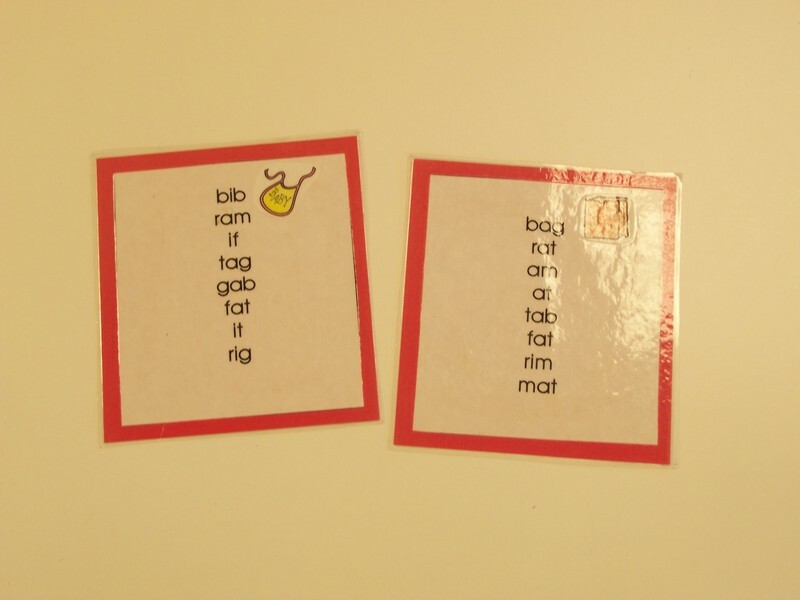 These are little phonetic books which can be read after the children have learned all 8 of the "red sounds". Keep in mind, however, that some children may not yet be ready to jump to "sounding out" words just because they know 8 sounds. And don't worry if they aren't ready. They can keep working on the picture and object sorting and move onto the yellow and blue sounds. It is perfectly fine if they aren't ready yet to make this leap. Decoding words requires a lot more of the child than associating a picture or object with its beginning sound. So.........I would not worry if the child wasn't ready for this material. If they had mastered the first 8 red sounds, I would just go on to the yellow sounds and work through those materials. 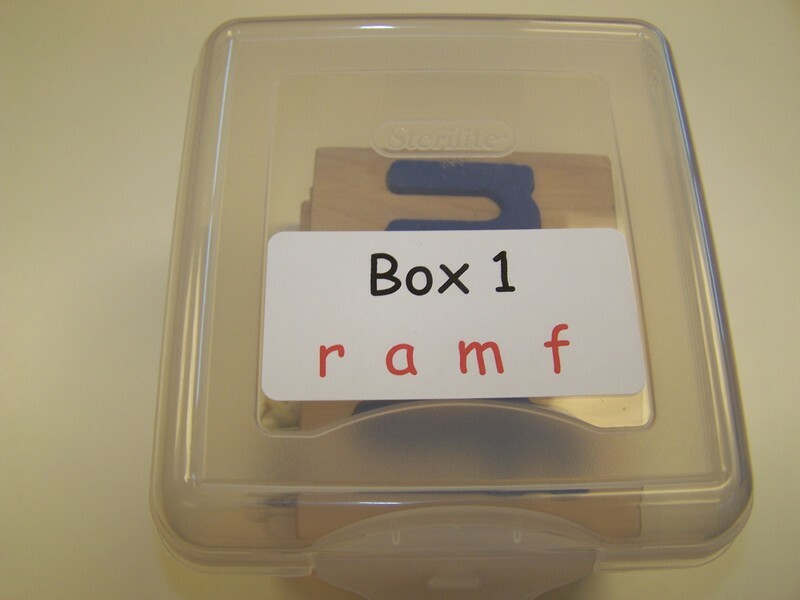 Another option for students who have learned the first 8 sounds is to do the red word drawers (this link has free downloads of the red/yellow/blue word drawers). Keep in mind what I said above, however. Not all children will be ready for this work yet. There are only 2 red word drawers in my system because there are not many words you can make with only 8 letters, especially words that you can find pictures for!! 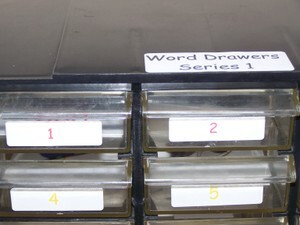 The above photo shows the 2 "red" word drawers on the left and the first red drawer with words and pictures on the right. Once they have worked through the yellow sounds, there are many more drawers because they now know 16 letters. 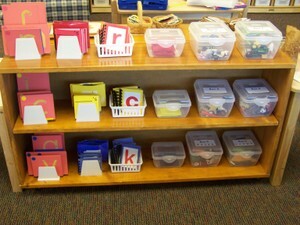 I would introduce children to the word drawers if they seem ready to blend sounds to make words. You could assess this with the moveable alphabet. For example, once they know the first 8 sounds, take out the moveable alphabet. 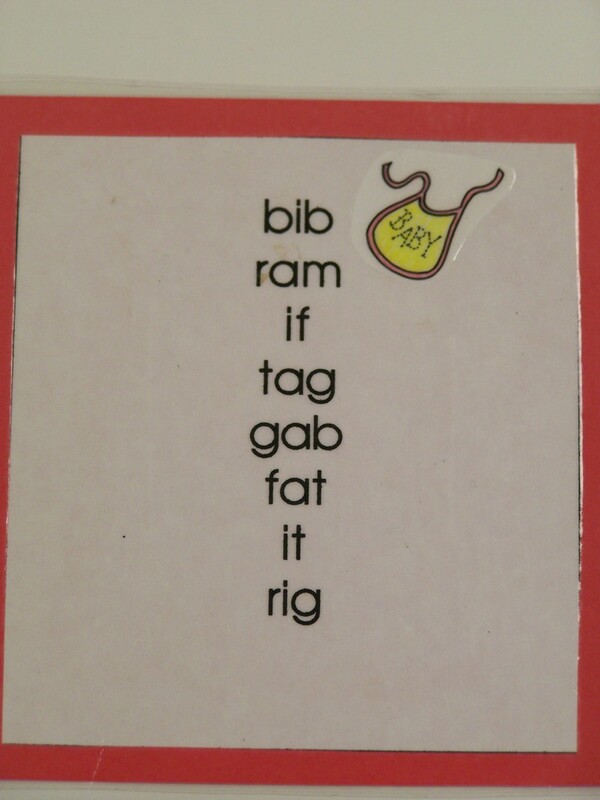 Choose a word made up of some of those sounds, but don't tell the child the word. Instead say, "get the /r/; get the /a/; get the /t/." When they have placed those letters in order on the rug, say, "You just wrote a word. Let's read your word." 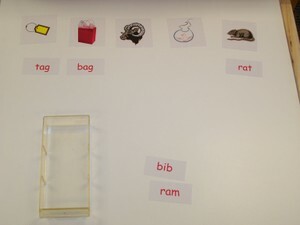 Model how to say the sounds individually and then blend them quickly to say the word. If you see that "light bulb" click on, try another word. If they seem able to do this, they may be ready for the word drawers. Don't despair if they aren't ready yet. Remember the last bird standing. He eventually left the nest, and your child/student will eventually be ready to do this. As I said before, if they're not ready but are still interested in the sound work, move on to the yellow sounds and try the blending again later. This photo shows my red/yellow/blue shelf. The shelf on the opposite side of it has the pre-reading activities that I wrote about yesterday. Just to the left and out of the picture is the little table with the sand tray. It is right next to the sandpaper letter end of the shelf so I can easily grab letters to introduce when sitting with the children at this table. You can see that from left to right on each shelf, I have the materials laid out in a progression. All the materials from the red shelf were pictured previously and up close in this post. 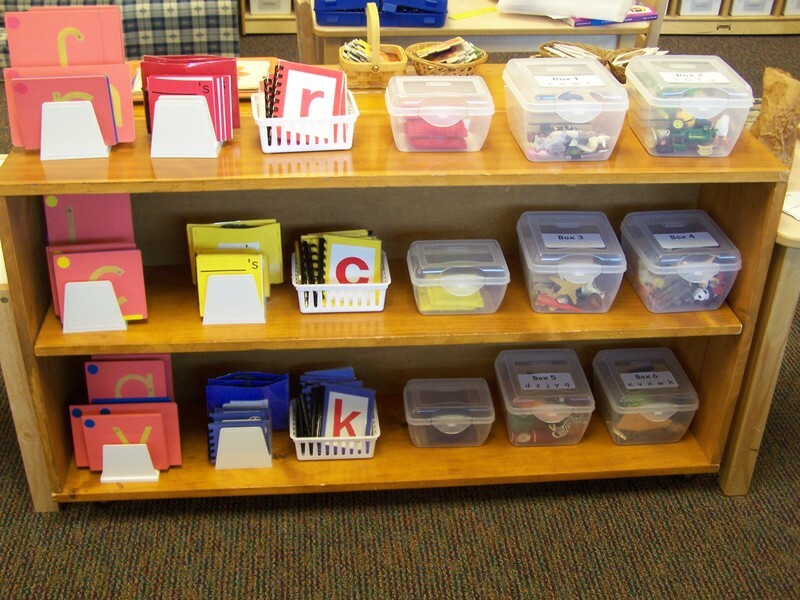 The yellow and blue shelves have identical materials which are tailored to the yellow and blue sounds. WHEW!!!!!!!!! I know this was a long post. However, I really needed to include everything about the "color" shelf in one post to keep it coherent. Let me know what you think........I would love to know if this has been at all helpful to anyone! Each letter book has between 6 and 8 pictures. I am not quite sure what you are asking, Donita. 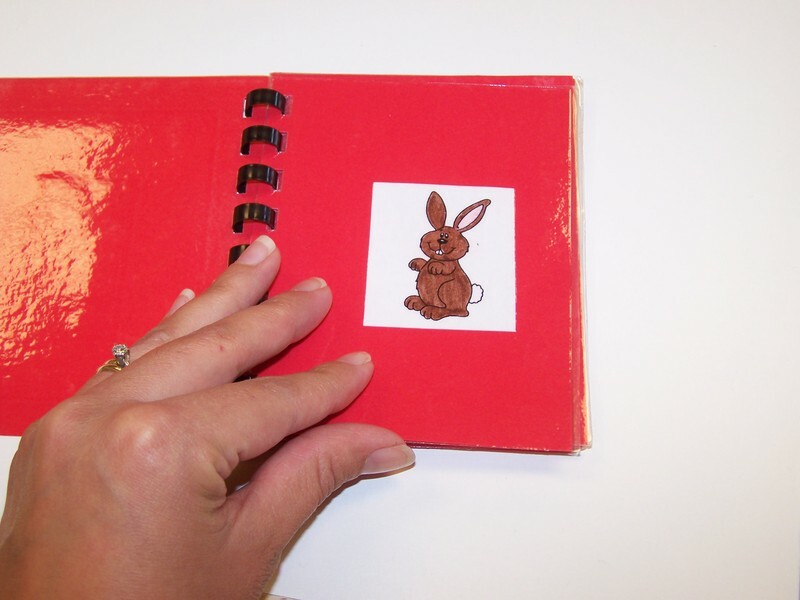 When you say letter books are you referring to the spiral bound books that have one letter on the front?If so, those do notcontain words, just pictures. After the sound is introduced the child reads the book of pictures that begin withthat soundto reinforce letter-sound correspondence. Hope thathelps! Amazing! This will be a tremendous help while homeschooling my son. Thank you! Hi! I am not sure what company its from. Ill TRY to remember to check when I go to school this week and email you back. Thanks for writing! 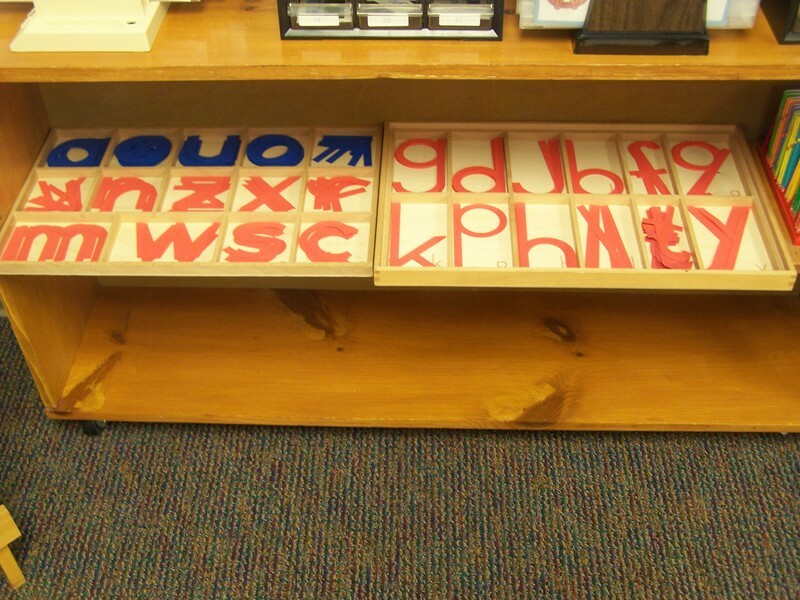 Do you have any idea what company made your moveable alphabet? I have one from a discount supplier and the letters slide around in there like crazy. They are always upside down or backwards. Yours fit nice and tightly in the box. I can't find one like it. Once children have mastered some of the pre-reading skills I discussed yesterday, they may be ready to move into the "traditional" Montessori language materials. Thanks a million for your Quality time. I am a Montessori teacher, and I love Language, your method is great and extremely helpful. I am starting the process of homeschooling my daughters montessori style. I have been so blessed to recieve many handmedown materials like the sandpaper letters and cylinders and the pink tower and brown stair...aand more! Arent I lucky! Anyway even with all of this and many of the free downloads online, nothing has been as helpful as these posts! Thankyou for taking the time to spell it all out for us AND for providing the free downloads for us!! I feel confident in at least the first few steps I need to take with my girls thanks to you!! Sinse I am working from home and have limited space, I dont suppose you would recommend the must haves as far as each teaching area, ie: practical, sensorial, ect. Thanks for any advise you are willing to pass along! I'm very new to your blog and already hooked!Really appreciate all the effort you've taken in explaining your language material it's probably the most systematic and clearest explanation I've been given after searching tons of blogs and books! We have very limited space in our preschool. I would love to incorporate a lot of your ideas. But I'm not sure how to do it with limited space. Any ideas? I have found this website in starting my very own Montessori Jorney. Actually I have been using many montessori techniques in my home since I discovered Motessori Learn and Play. Any way I have been wondering how to organize and prepare some of the other work and your blog has been invaluable. 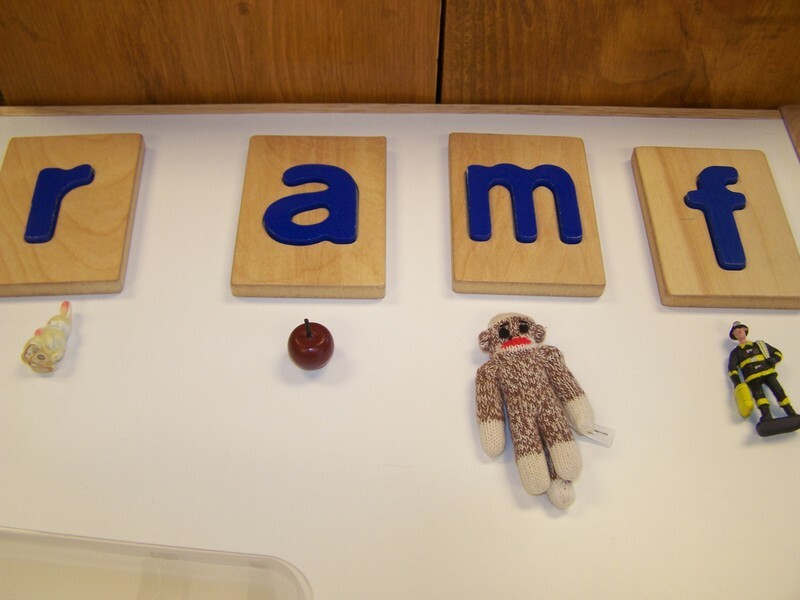 I have told other Montessori moms about this wonderful blog. I think these posts are great and very helpful. I appreciate the thoroughness and the information about how to go about assessing readiness. I am blown away by your organization! I must admit my language area is in need of a major facelift. I have used the pink, blue, green system for years and have been ho hum about it. I am enthralled by your system and I'm considering adopting it. What color coding system do you use for blends and digraphs then?